Identifying hybrid species. hybridization in natural populations, and assessing the history and extent of introgression between species. Assessing genetic variation within a species or population, including small or endangered populations, and estimates such as effective population size. Measuring the impact of inbreeding and outbreeding depression, and the relationship between heterozygosity and measures of fitness. The first agricultural revolution was the greatest contribution of genetics to society during the first 10,000 years. Many plants with different genetic make ups were domesticated. Then applications of plant breeding techniques started the second agricultural revolution. Modern varieties were bred for high production and uniformity. But these varieties have only Small proportion of the ancient stores of genes. Today the same, or closely related, varieties are grown in many parts of the world. Even in the less developed countries uniform modern cultivars are rapidly replacing the traditional, or “primitive”. The “green revolution” has greatly intensified this process in some Asian countries. The dramatic improvement of food production has saved mankind from extensive starvation. But it also has deprived the world of valuable genetic resources. Now very few genes of the ancient wild plants are left. It is a matter of great concern. The environment of the earth is changing rapidly. It is possible that these few selected genes in selected varieties may not support the plants in changed environment. It can destroy all our selected varieties. Therefore, we need a great gene pool of ancient wild plant. The preservation of this gene pool is called genetic conservation. (a) Socially Conditioned Parameter: In includes establishment of botanical and zoological gardens and parks. (c) Genetic or Evolutionary Parameters: variation and selection. Following strategies can be adapted for conservation of genetic pool. Collections in Fields and Gardens: Primitive cultivars (traditional varieties) cannot be preserved in situ. It requires the preservation of farming systems which is impossible. Fortunately, this is not needed since representative samples can be collected in the field and safely preserved for long periods. A collecting program for any species requires information on the areas where collections are to be made. Many nations are preserving their genetic resource by this method. They are establishing botanical gardens, research farms and wild farms for this purpose. There should be at least one copy of each variant occurring with frequency greater than 0.05. There sample size should be of 50- 100 random individuals per site. Preservation of Seeds: Conservation procedures has greatly improved and simplified for seed-propagated plants. Plants are most safely conserved in a dormant state, i.e. as seeds, which avoids the risks and expense of growing stocks. Viability and genetic integrity can be maintained at a high level for many years provided seeds are stored under appropriate conditions of temperature and moisture content. Seeds of most species can now be preserved for decades. This may be extended to centuries once more experience has been gained in storage at sub-zero temperatures. Seed stored in a fully imbibed state or kept at the temperature of liquid nitrogen. It avoids the risk of genetic damage. 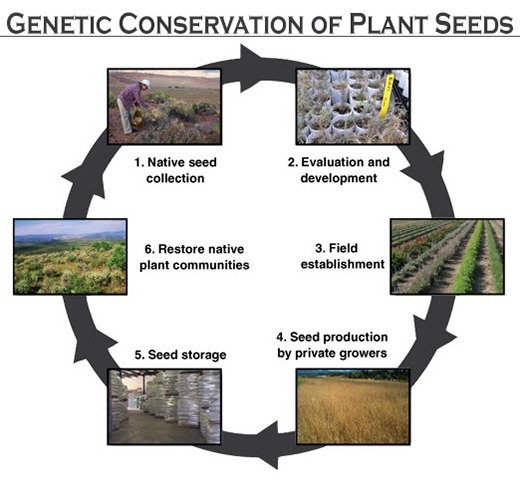 Conservation of Wild Plant: Wild varieties of plant are rich sources of genetic pool. Unfortunately, little attention is paid to conservation of these plants. Conservation of Natural Communities: It is not an easy task because it involves many social, political and economic issues. But it necessary to preserve natural communities from encroachment. The main aim is to provide optimum conditions in these communities. Role of International Organization in Genetic Conservation: United Nations action programmers’, with the International Biological Programme (IBP), in collaboration with FAO, playing a major part. A global network of genetic resources centers was endorsed by the United Nation as Conference on the Human Environment.